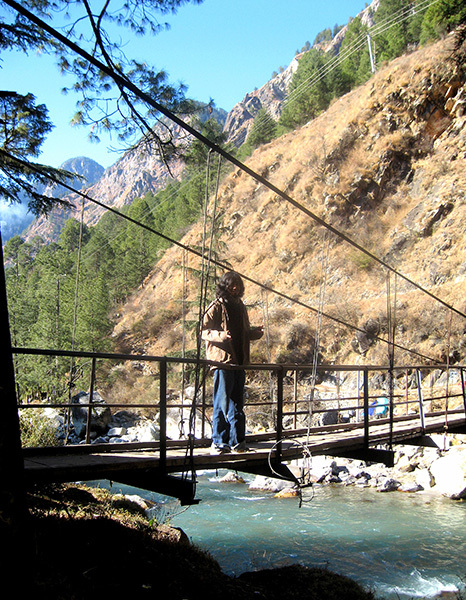 Visiting Kasol in January is a little bizarre, yes, but an adventure nonetheless. It is a small town on the banks of the Parvati river, a few hours south of Manali, and can be covered on foot within an hour. It presented itself as an ideal weekend getaway as we sat in Delhi one dreary evening, pondering about things we could be doing in life. Hot springs at Manikaran. Photograph by Malavika Bhattacharya. We hopped on to an 8 p.m. bus to Manali on a Friday evening, got off en route at Bhuntar the next morning, and started off on the picturesque, frozen trail to Kasol. Upon our arrival, we found the town eerily deserted, and were told that most of the city had migrated south for the winter. Not wanting to freeze on the streets, we hurriedly managed to find a warm bed and hot water at The Holiday Home. Given that it was close to freezing point, I put on five layers of woolens (everything I had carried) and hit the streets. The lanes are dotted with German bakeries and Israeli cafés. There’s a large Israeli population in Kasol, and many of the signboards are in Hebrew. These remained shut throughout the entire duration of our trip, as the café and shop owners had taken their fare and headed to Goa for the winter. Nevertheless, we did manage to find two cafés in the town that were open, and we alternated between them for breakfast, lunch, and dinner. Our first breakfast was at Little Italy, where we sat out on the balcony with a view of snow-capped mountains, and tucked into our bruschetta, omelettes, and chocolate pancakes like starving children. Once adequately fed, we set out to explore. We were greeted by smiling locals, inviting us to look at their fare as they roasted their organically grown hashish. They sold hippie wear: Braided woolen caps and psychedelic skull-embroidered pants. It was an absolutely indistinct clash of cultures. There are no tourist-y attractions in Kasol, and we spent our time walking along the Parvati and enjoying the unspoilt views. There are some nice trails through the foliage and, while trekking through one, we came upon a rickety bridge that went over the river to the mountain across. 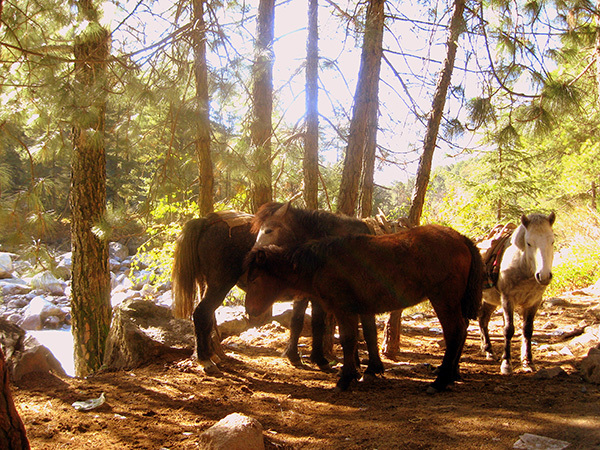 It creaked manically with every gust of wind, but on the other side was the golden sun bouncing off the rocks, a narrow wooded trail following the rushing Parvati river, and wild ponies grazing on a mossy patch. It was like something out of a postcard, and out came the courage needed to cross the bridge to The Other Side. We spent most part of the day there, moving with the sun from rock to rock and watching the gushing river turn from blue to white. Few locals walked by, carrying their firewood, vegetables, and babies up the threadlike slope. It was like being at the edge of the world, away from all civilisation. As the sun slowly disappeared, our stomachs started rumbling, and it was time for lunch at Café #2: Evergreen. This place, to put it very eloquently, was simply fantastic. It’s hidden away behind shrubbery, and has dimly lit smoky interiors. The coal fire in the centre made it warm and comfortable after the bone-chilling cold outside, but what really made me fall in love with the place was the music. They played the most amazing collection of Dylan, The Stones, Steve Winwood, and Jethro Tull. My lunch extended from 3 p.m. to 6 p.m.—all that walking really worked up an appetite! The cheesy baguette with hot noodle soup, wood oven pizza, and mint tea were to die for. Most places here had identical menus, with predominantly Israeli and Italian fare, but this place won my heart hands down. 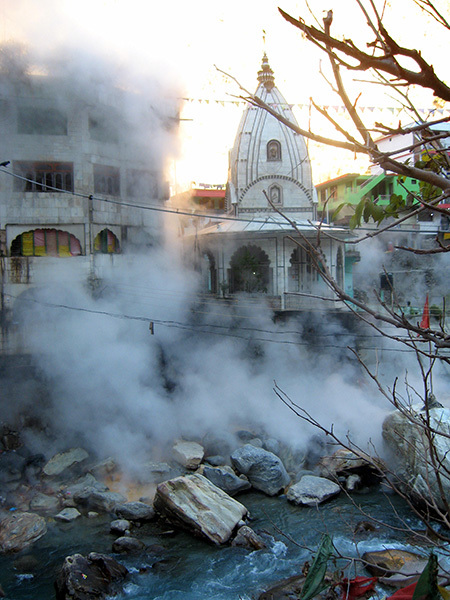 The natural hot water springs at Manikaran, the neighbouring town, are a popular tourist attraction, and quite fascinating to look at. The Gurudwara there has made provisions to bathe in the hot sulphur water, but we decided against it as it was more of a common swimming pool. The walk around the town was interesting enough, with “steam-wells” every few yards. These are wells of hot water from the springs and are also used as natural heaters because of the dense steam that emanates from them. I stood around one with the locals until I was warm and toasty, and then decided to trek back the seven kilometre winding stretch from Manikaran to Kasol. There ended my blissful trip to the Parvati Valley, with no cell phones or laptops. Off-season or not, it was worth every bit of effort. malvika!! remember me from google! tanvi! eeh – fellow googler on helter skelter! super awesome photos!! Yes of course… how cool is this :D thank you! Been planning a trip ever since a few of my friends went last year. Any idea if you can buy a house and live there forever? 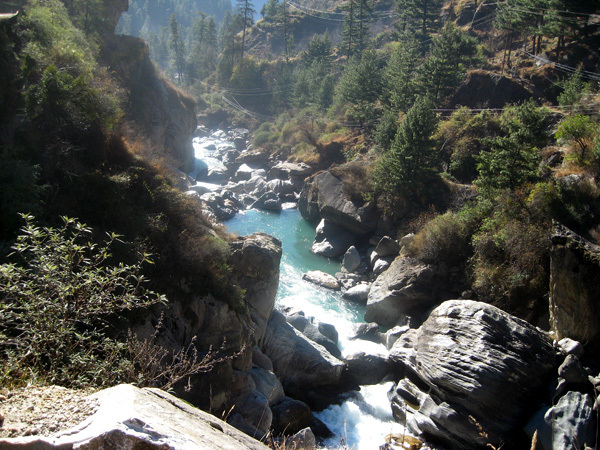 Nice pics….we have recently been to Kasol…i have read others posts as well….admire your passion for travel..
Great! Just the info I needed as a couple of friends are planning on visiting Kasol and the surrounding in December. Thank you! can u gimme is it advisible to go to kasol in january..?? and is the trek to malana possible then? 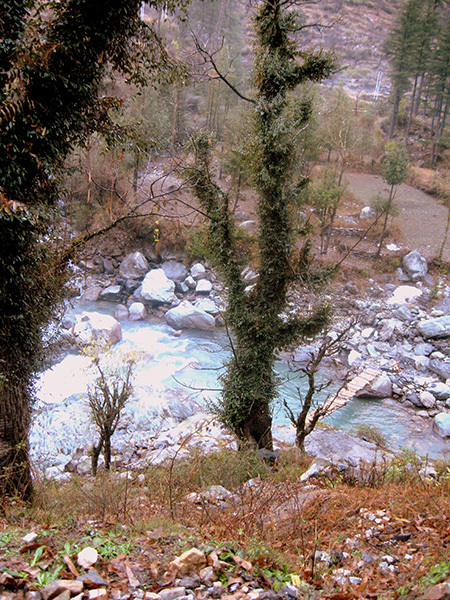 My friends are planning a trip to kasol in January first week. Is it okay or can we face some problems in trek?? Can ypu please suggest something . Hi.. I am planning a solo trip to Kasoli next week. Would love to be with fellow travellers.